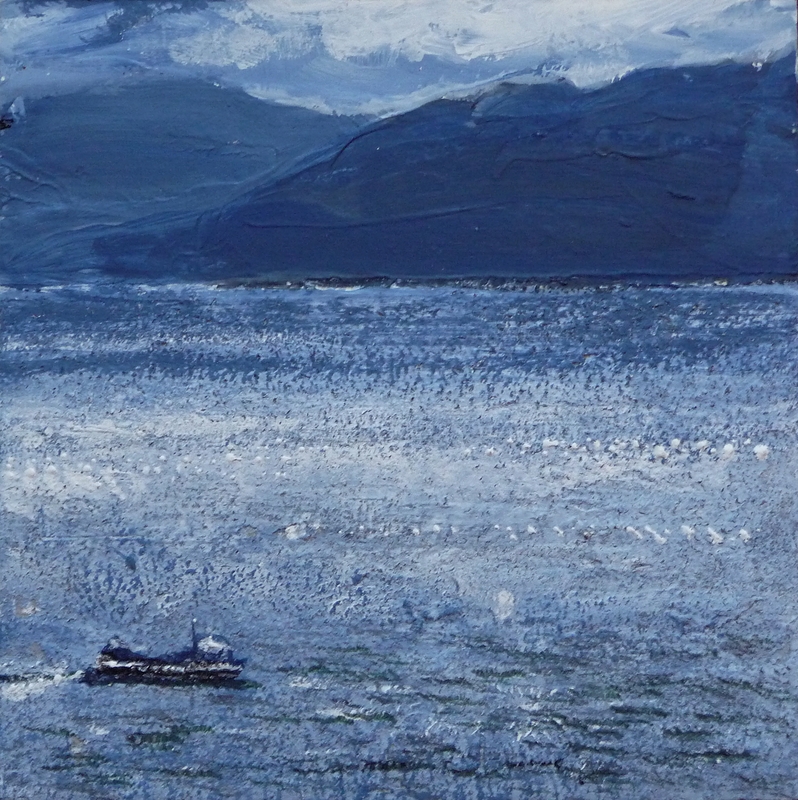 Many thanks to the Flaubert Gallery for featuring the Eigg project on their website (link below) – paintings by myself, poems, J.L Williams and music by Atzi Muramatsu. The feature includes a link to our collaborative video made earlier this year, one of those projects I can truly say I feel proud of! 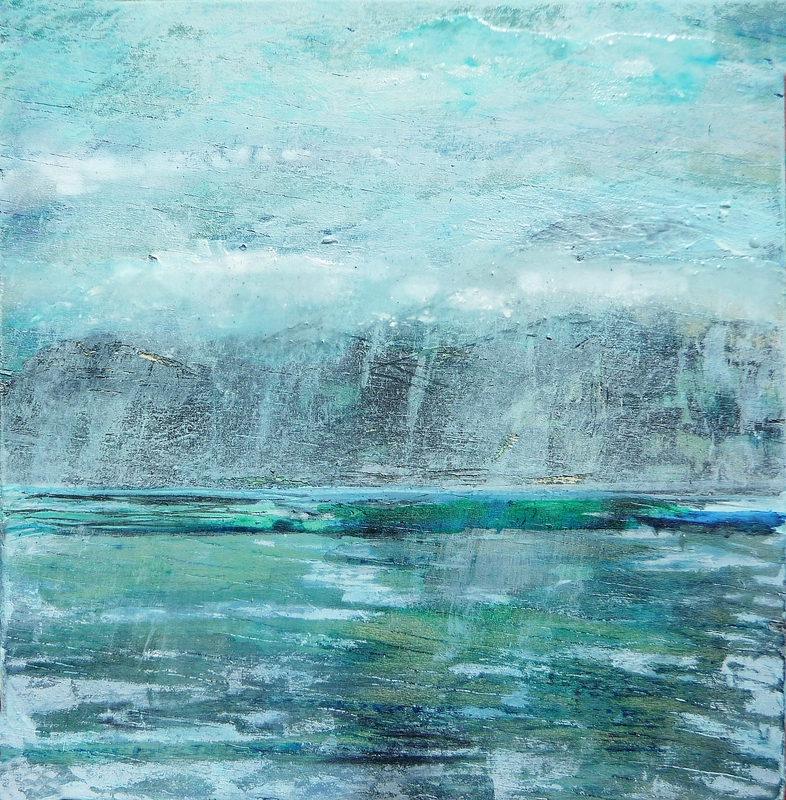 I still find it very moving – beautiful work by Jen and Atzi. 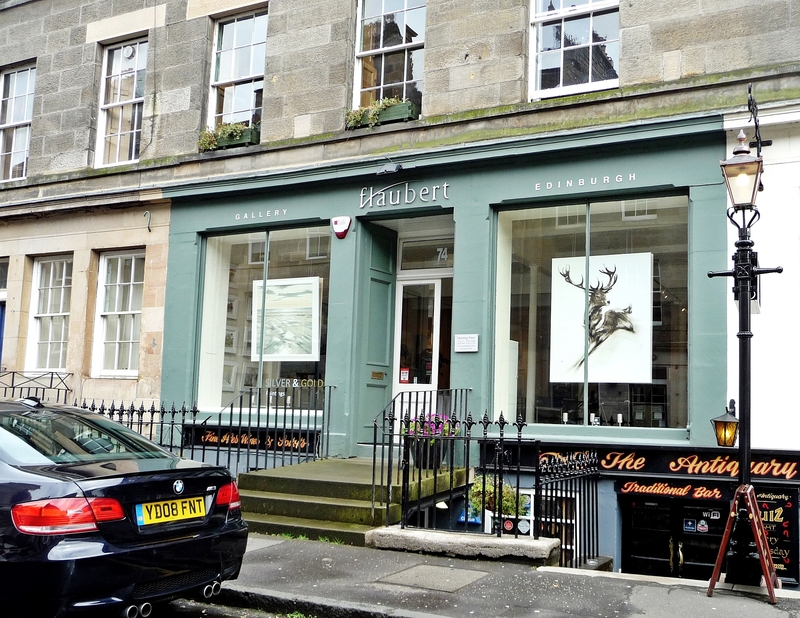 The paintings ‘West’, ‘North’ and ‘East’ are available to buy through the Flaubert Gallery where they’ll be on exhibition until later this year. 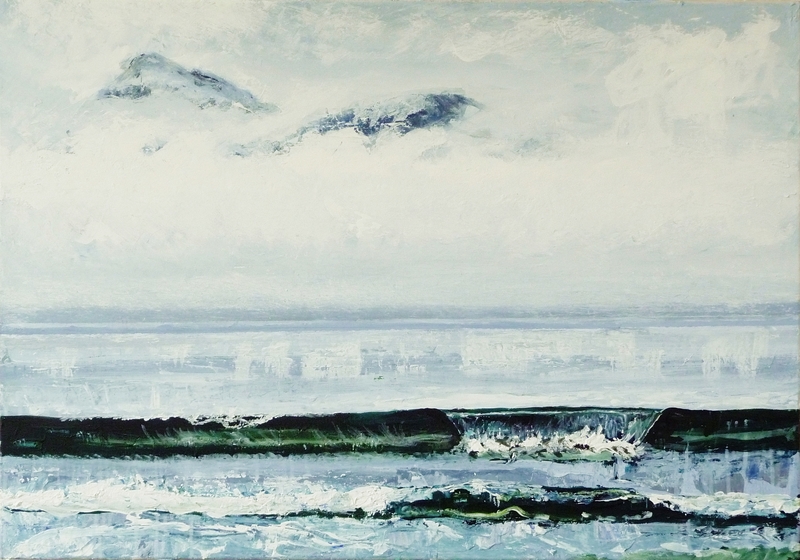 This entry was posted in Uncategorized and tagged isle of eigg, largescale landscape paintings, paintings of eigg, Paintings on wood panels, Scottish landscape painting on June 23, 2015 by rosestrang. 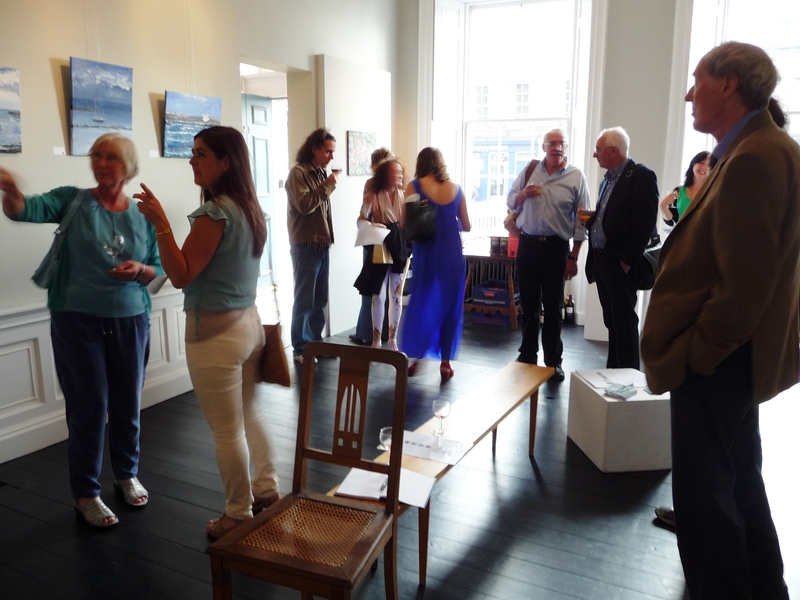 A magical evening at the Whitespace Gallery..
To spend several months painting a subject can be quite a solitary challenge, though meaningful. 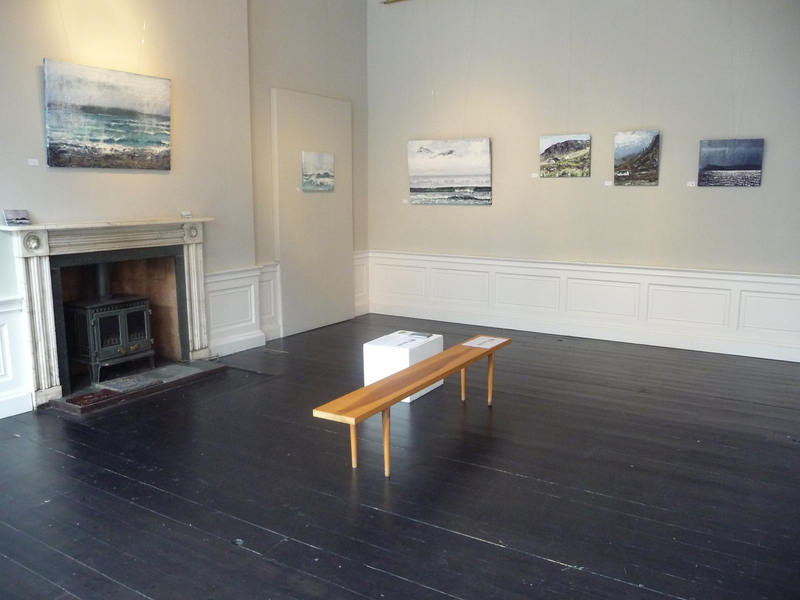 Then when you share your efforts with the public, it’s a vulnerable moment to see your paintings (which seemed such large swathes of blank canvas) for the first time in the gallery, where they appear to be swallowed up in public space! The journey from personal to public was borne along on a tide of good feeling, thanks to the help of family and friends! But also by two very moving performances by Jennifer L Williams and Atzi Muramatsu, who responded to the paintings in poetry and music. 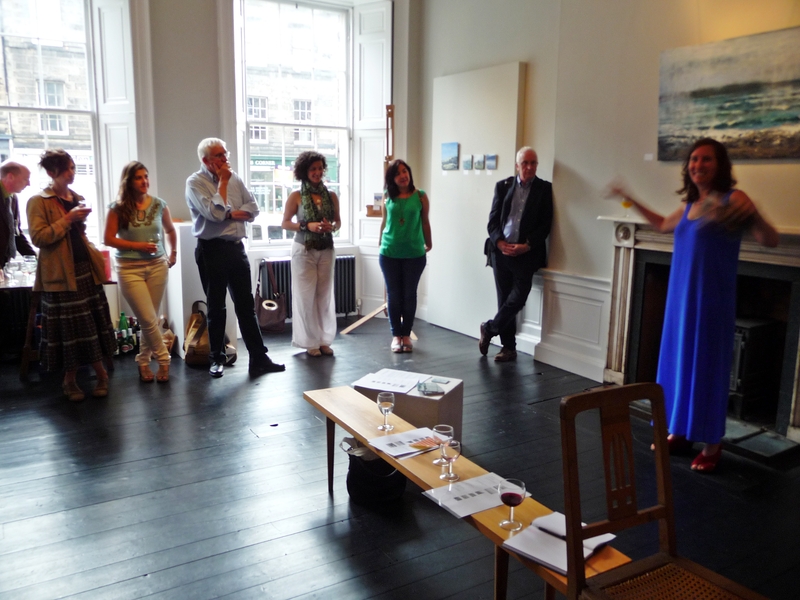 Jennifer recited three poems, one of which was written in response to ‘Mountains of Rum from Laig Bay’, and Atzi improvised on cello to several paintings in the exhibition. I was so very moved by their artistic responses, I found them quite magical, and I’ve included two videos here, along with the text of Jennifer’s poem. I felt so uplifted and inspired by the preview night, and I really look forward to future collaborations with Jennifer and Atzi. Also, many thanks to mum, dad, Alicia and Lucrezia for their help! 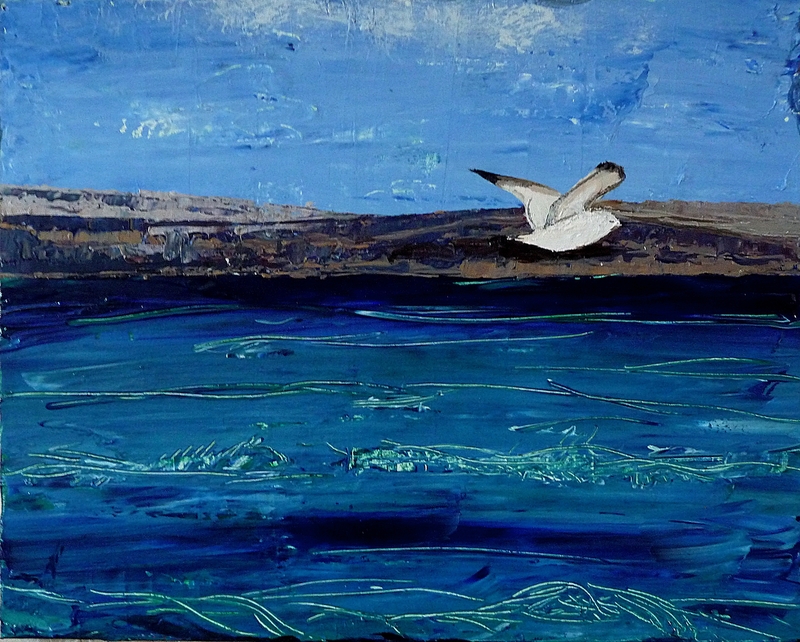 This entry was posted in Uncategorized and tagged Atzi Muramatsu cellist/composer, eigg art, Eigg Island, jennifer L Williams poet, paintings of eigg, rose strang paintings, scottish landscape art on July 20, 2014 by rosestrang. 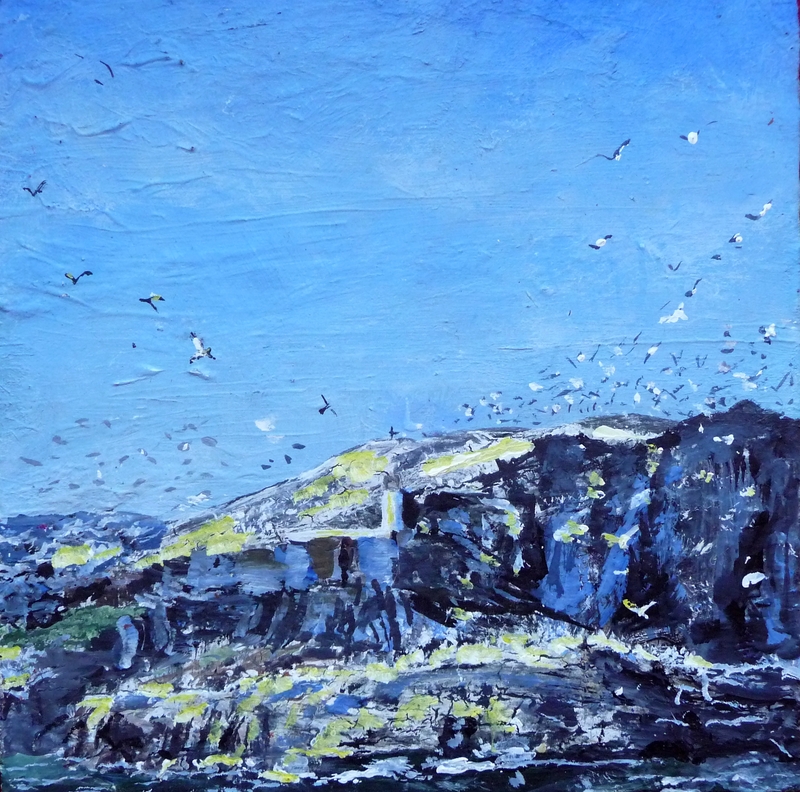 This entry was posted in Uncategorized and tagged eigg art, paintings of eigg, rose strang art, rose strang paintings, scottish landscape paintings, Whitespace Exhibition Rose Strang on July 16, 2014 by rosestrang. I hope you’re all enjoying the beautiful sunshine. It’s just as well the UK light lasts until 9pm since I need all the light I can get to finish this latest series! I’m feeling more into the swing of it now, as usually happens about halfway through. I’ll be sending a catalogue of all new works/prices/dimens’ etc for the exhibition to former buyers on the 16th July – what’s known as ‘first refusal’, for those who’ve bought work before. 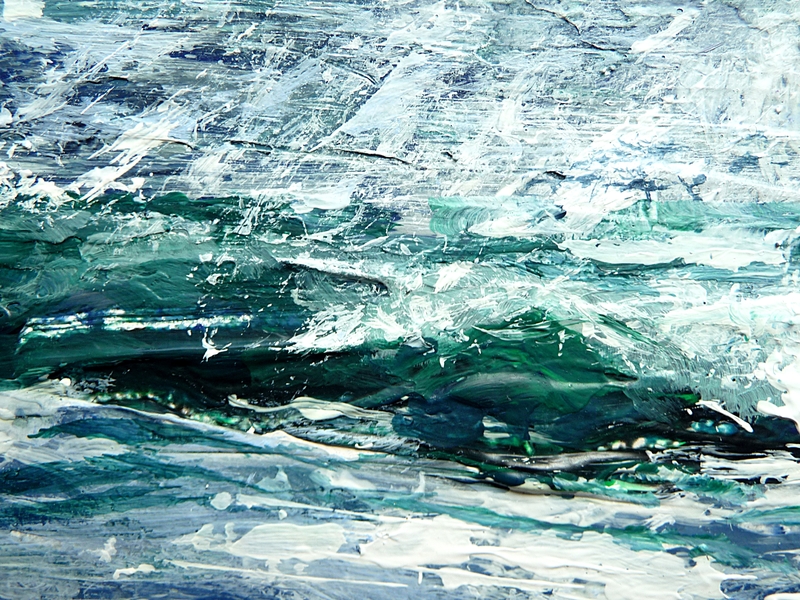 There’s no obligation to buy obviously, but if any previous buyers are interested in originals or prints for the exhibition they have the opportunity to reserve works. 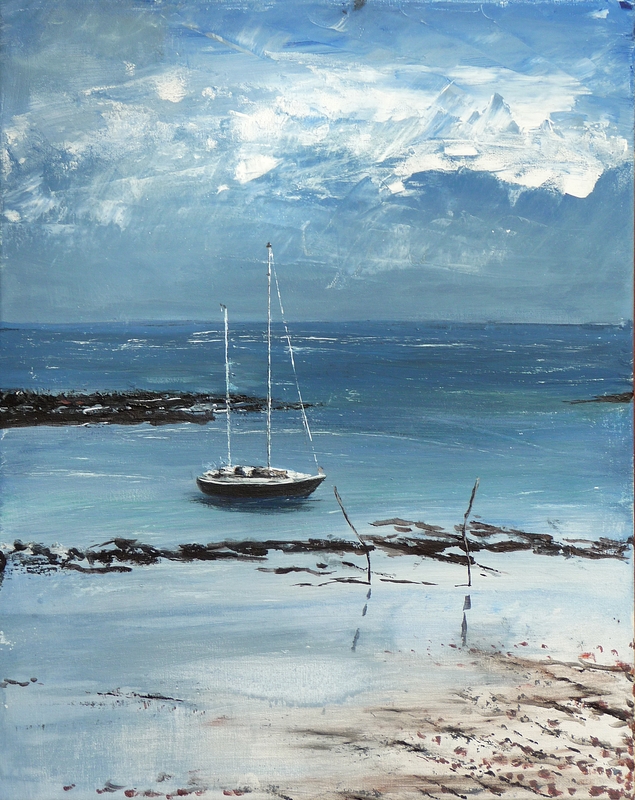 This entry was posted in Uncategorized and tagged paintings of eigg, paintings of Rum, rose strang artworks, rose strang paintings, sea paintings on July 11, 2014 by rosestrang. 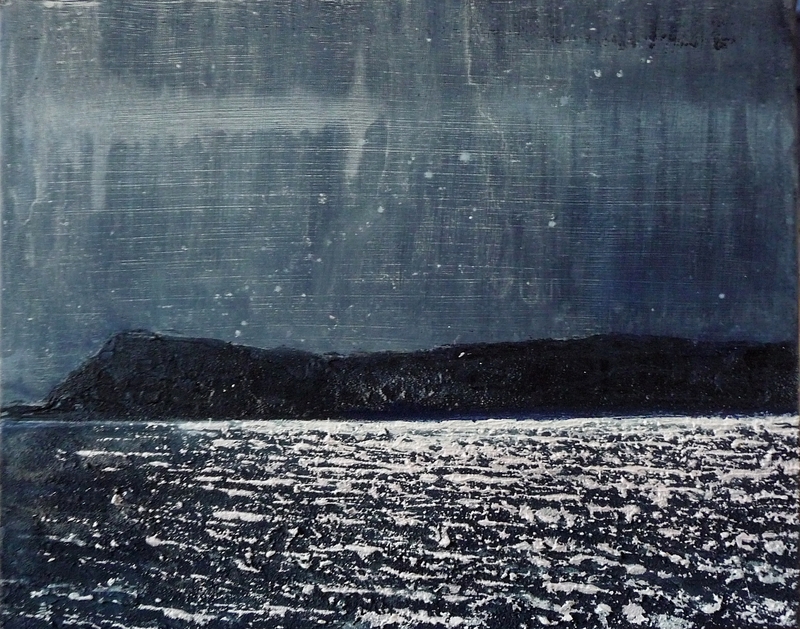 50 Paintings of Eigg. No. 50! 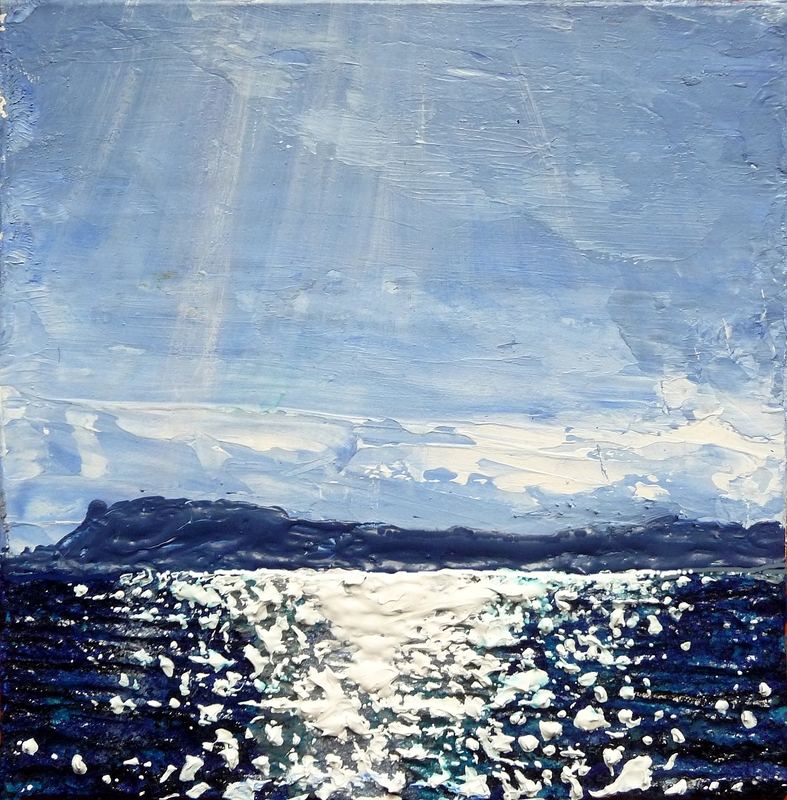 No 50; A view of Eigg from the ferry, with sunlight sparkling on the sea. 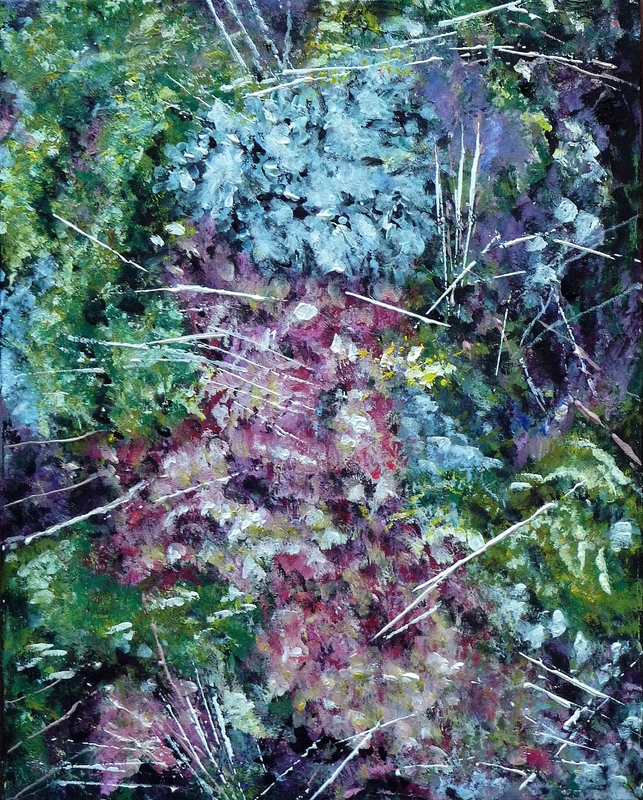 Well, this has been such an enjoyable project – mostly the daily discipline of painting, and the feedback that follows, thank you! Also it’s been enjoyable for the chance to explore subjects I care about – landscape, ecology, social justice, history and the arts. 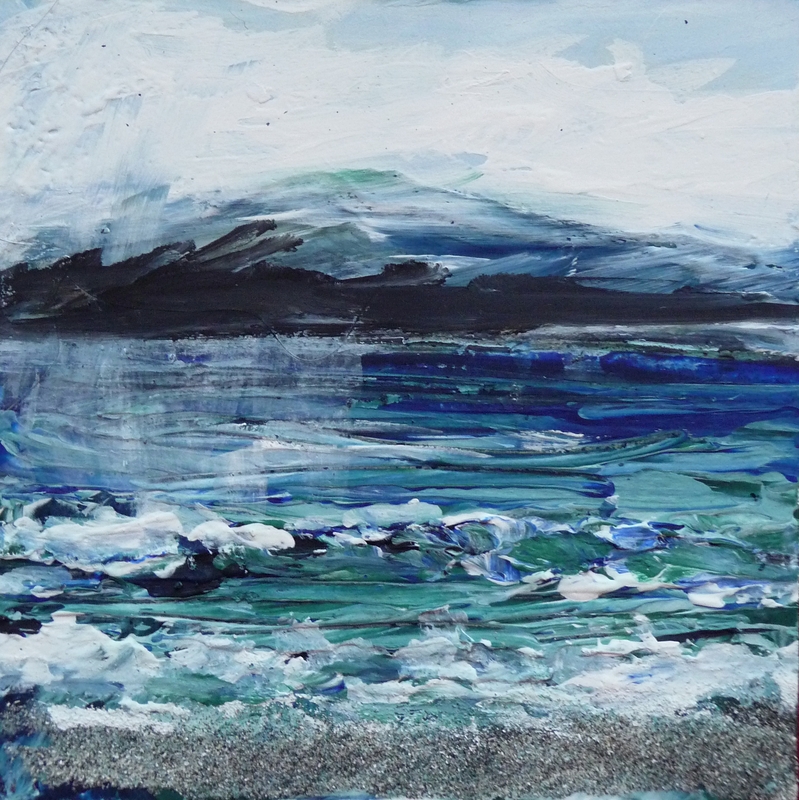 The Isle of Eigg has been a perfect focus for that – a wonderful example of a way of living that’s collaborative, innovative, cultural and above all respectful of our planet. 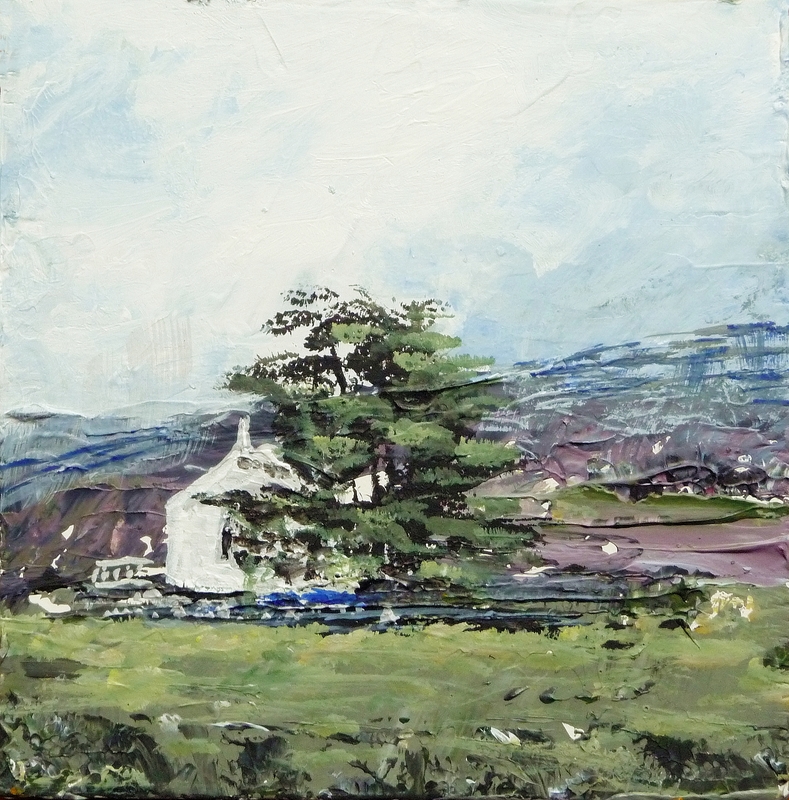 It’s been wonderful getting to know new people through the 50 Paintings Blog, many thanks for following it. 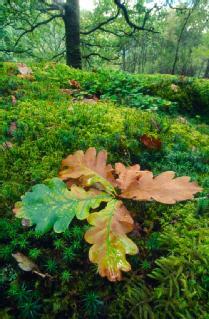 Sincere thanks to readers, also the following Eigg people, buyers and social media sharers. It’s much appreciated! I wish you all a lovely summer! 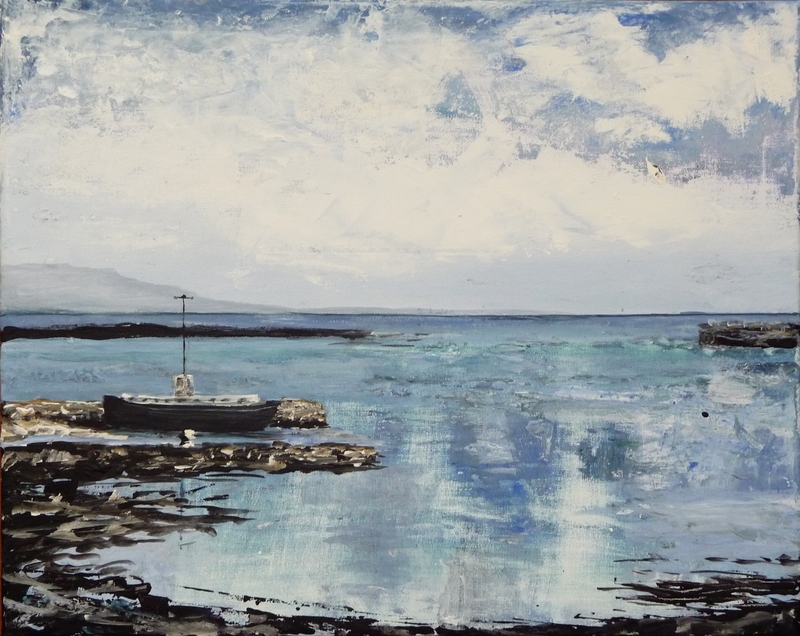 This entry was posted in Uncategorized and tagged eigg art, eigg paintings, isle of eigg, paintings of eigg, rose strang art, Scottish landscape painting on May 29, 2014 by rosestrang. 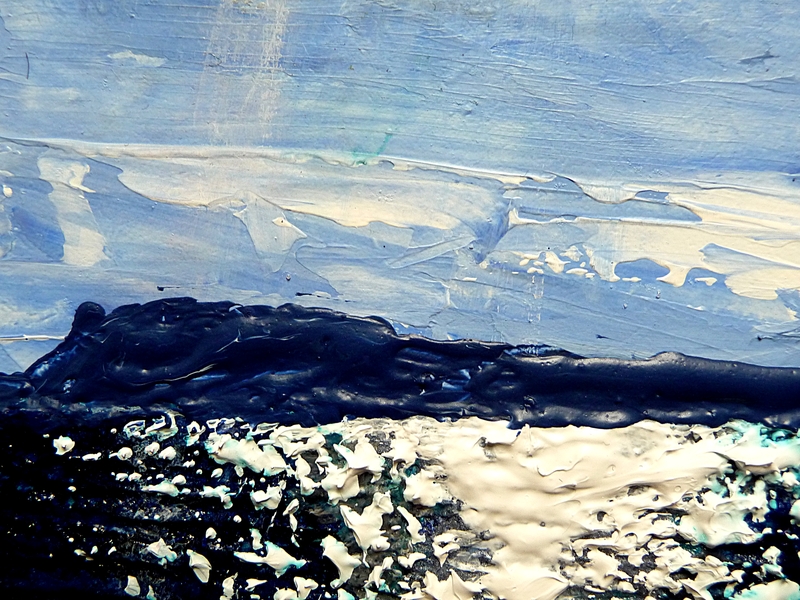 Today’s painting; The mountains of Rum from Laig Bay with turquoise sea in the foreground. 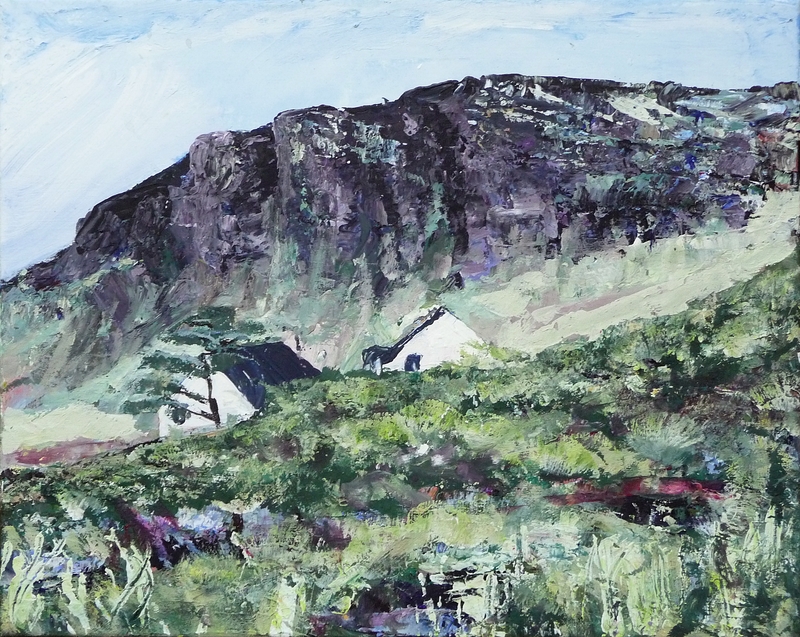 Tomorrow is the last day of ’50 Paintings of Eigg’ – I’ll miss this daily blog and painting! But I’ll still blog once or twice a week with painting updates etc. Just click ‘Follow’ on the right hand column under the Facebook section if you’d like to receive email updates. I tend to think that perfume, and the sense of smell in general, have been given something of a back seat in terms of the human senses. Smell is often described as a primitive sense, linked to instinct, as if our other senses weren’t also integral to negotiating our environment! And it’s almost as though love of perfume is something to be kept in a closet; a frivolous concern. Yet, think of those who after receiving cancer treatment may lose their sense of smell – with no knowledge of whether or not it will return. This is what happened to a friend of mine (Calum, who runs the printing company Giclee UK, who make art prints from original paintings. I’ve relied on their services quite a few years now). He described how overwhelmingly sad he felt at the loss of smell following cancer treatment some years ago, and the sense of joy when many months later on opening a bottle of Shiraz wine, it all came flooding back. 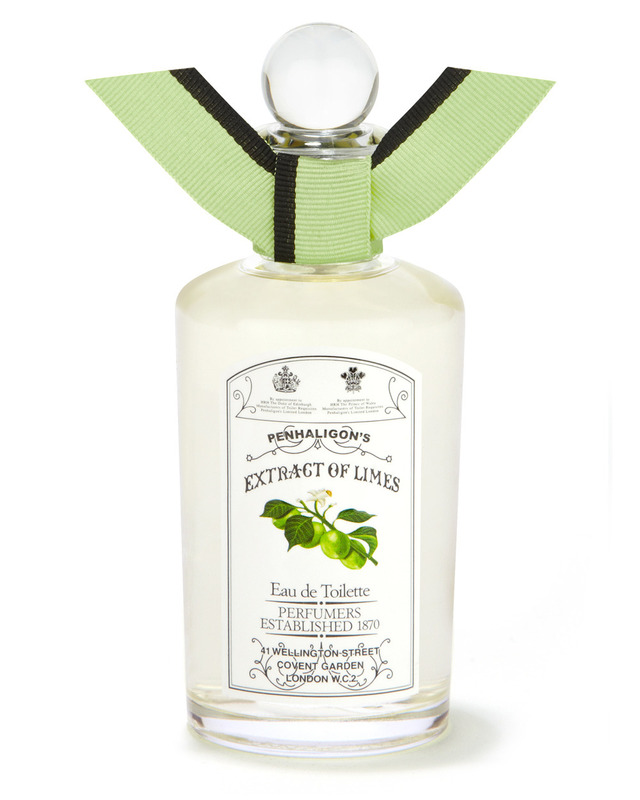 It gave him a new appreciation of scent, and on discovering that his favourite lime-scented soap from Penhaligons had been discontinued, he decided to concoct something similar himself, and thus an amateur perfume-maker was born! I’ve only experimented a little with perfume absolutes and essences, but I’ve been collecting and testing perfumes for a few years now and have a good idea of what I’d like to create. 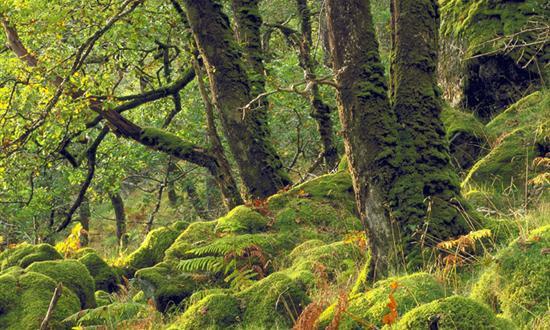 So in collaboration with Calum, the plan is to create a new perfume based on the the scent of the Oak woods of Ariundle on the West Coast of Scotland. 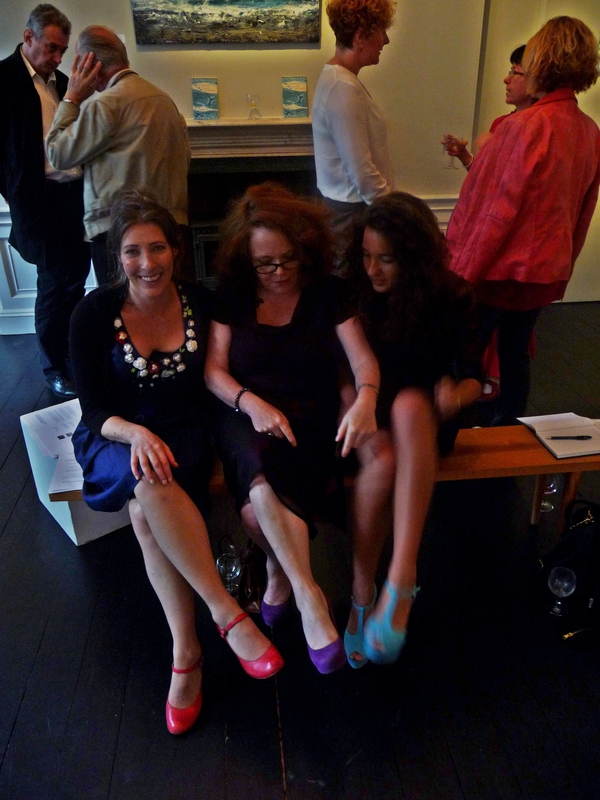 I’ll be sure to post information here if and when we launch the perfume, which will of course be titled Ariundle. It’ll be a soft woody/green floral with hints of moss – I can’t wait to begin experiments! 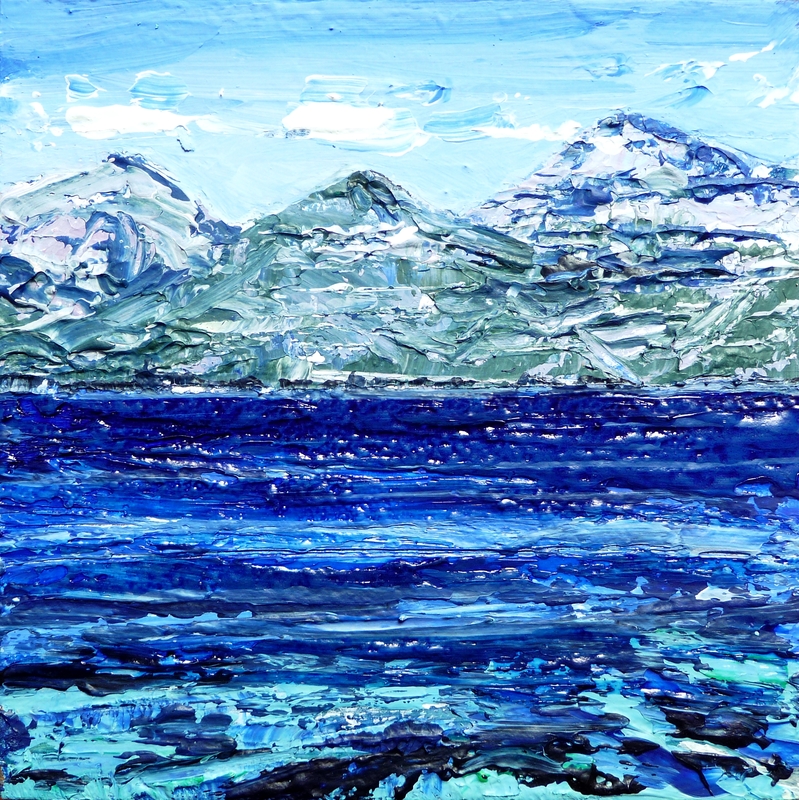 This entry was posted in Uncategorized and tagged eigg art, Laig Bay, mountains of rum, paintings of eigg, Scottish landscape painting on May 28, 2014 by rosestrang. 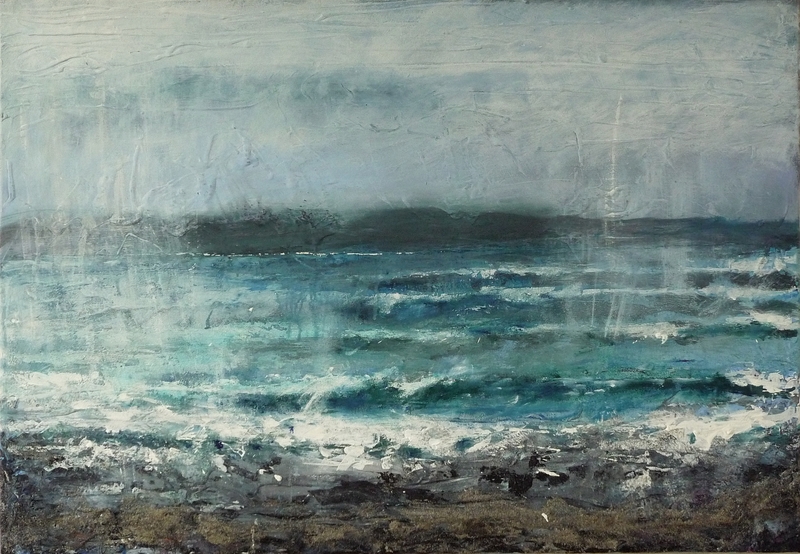 Today’s painting; Sea-spray and turquoise wave in Singing Sands Bay. 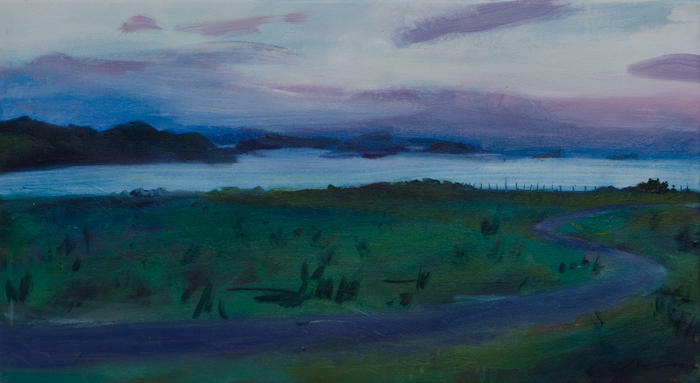 I haven’t included any Scottish artists so far in this blog, or female artists come to that, very remiss! 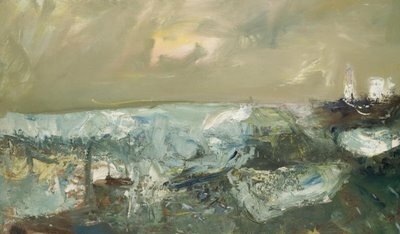 And as it happens, my two favourite Scottish landscape painters are female; Joan Eardley and Kate Downie. 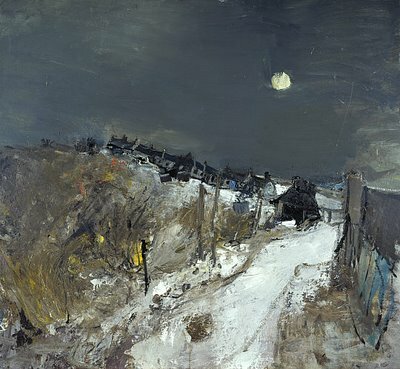 Eardley was born in Essex to a Scottish mother and English father then later, in 1940, moved to Glasgow and enrolled at Glasgow School of Art. (Incidentally you may have heard the sad news about the fire that recently broke out at Glasgow’s School of Art. I was relieved to hear that there was just 10% damage, but there was also quite a lot of damage to art work including student’s degree work for this year. Terrible news, but I have no doubt that restoration of this beautiful Rennie MacIntosh-designed building will be meticulous. 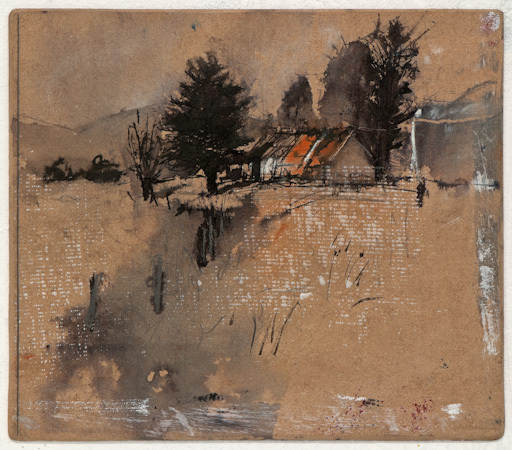 Eardley was renowned for her portraits of children in Glasgow tenements in the 40s and 50s, though as a landscape painter I’m most interested in her landscapes. 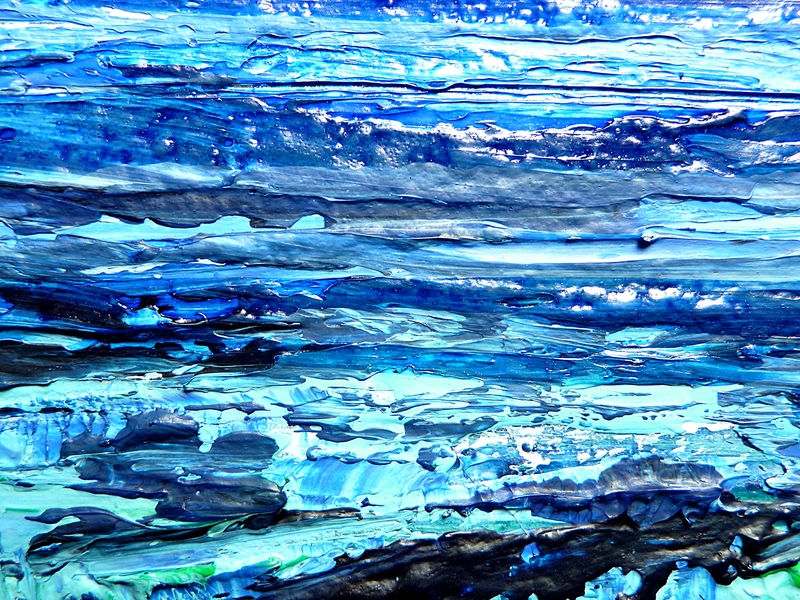 It’s said she was influenced by the Scottish Colourists, but I tend to think her work is more intensely expressive and semi-abstract – far less post-impressionist in feel. 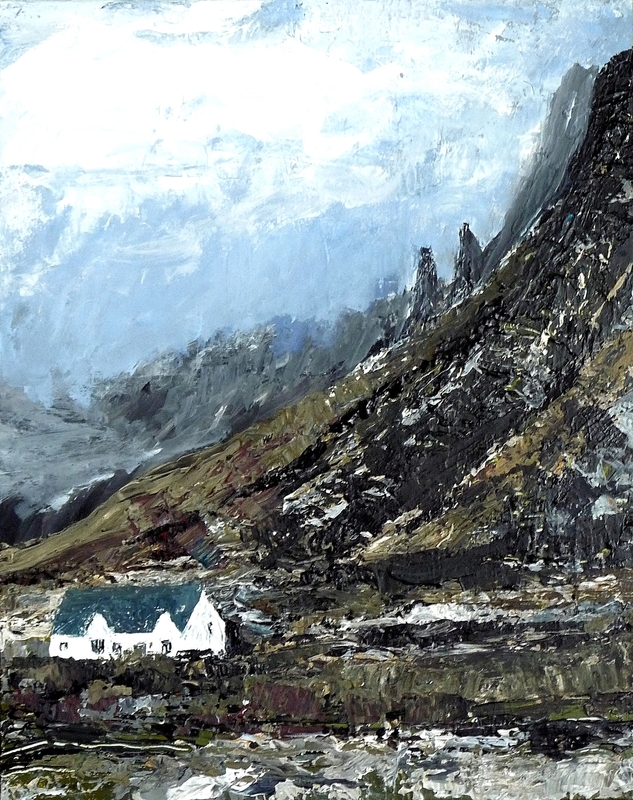 She eventually set up a studio in Catterline near Aberdeen and focused on landscape painting while there. 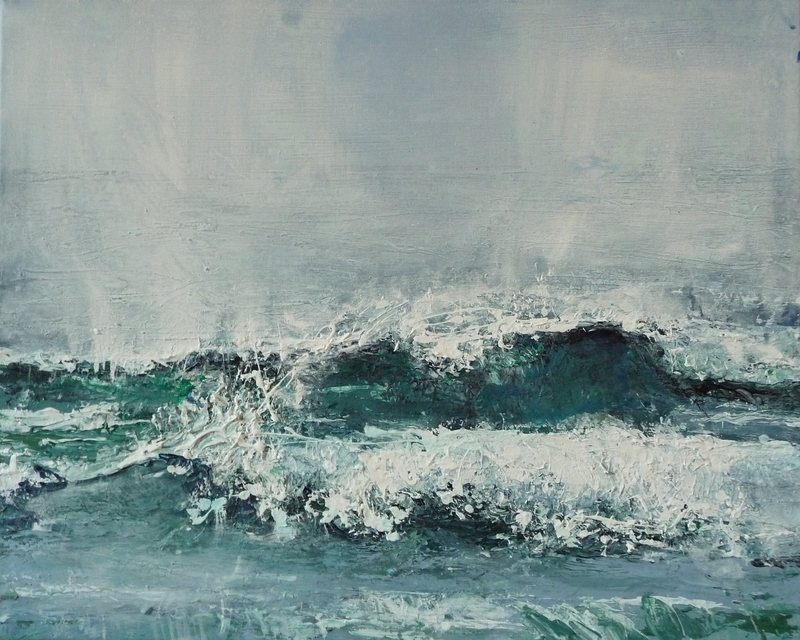 I’ve long admired her expressive, immediate and atmospheric style; she has that visceral quality to her work – a way of making the viewer ‘feel there’. Although highly acclaimed in the art world, she perhaps never gained the full recognition she deserved due to her untimely death at the age of 42. Kate Downie was born of British parents in America, but moved to Aberdeen at the age of 7. 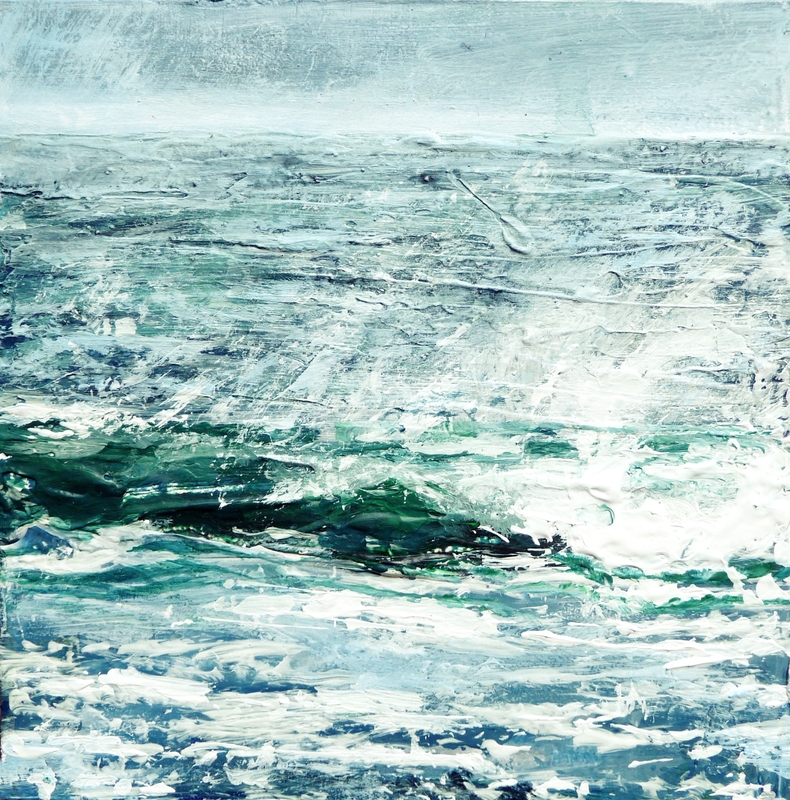 She’s a high profile artist within Scotland and was recently President of the Society of Scottish Artists. 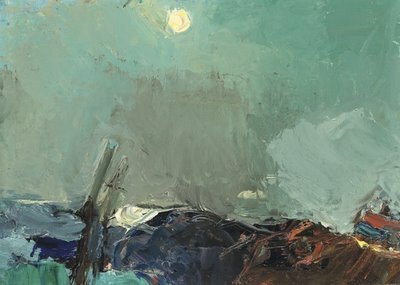 Though influenced in many ways by Eardley’s work, Downie’s style is far more graphic, less textural and often includes line work in ink. 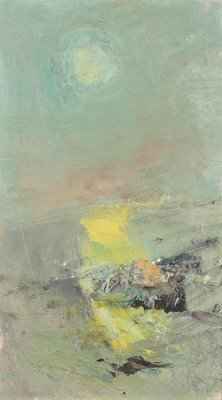 This entry was posted in Uncategorized and tagged eigg art, joan eardley, kate downie, paintings of eigg, rose strang art, singing sands bay on May 27, 2014 by rosestrang.